I just love October and everything that comes with it! From all things pumpkin to colorful leaves, it's the start of one of my favorite times of year. From now through the end of the year it's one holiday after another and that means my front porch gets lots of makeovers this time of year. I always decorate indoors for holidays, but I love to decorate the front porch also because I feel like not a lot of people come in my house, but a lot of people come by my house or at least to the front door! Plus, it just feels more welcoming to our guests and even just our own family as we drive down the driveway. Yesterday while the kids were at school I pulled out all of my Halloween decorations and when they walked down the driveway after hopping off the school bus they were so excited to see all of the fun decorations. 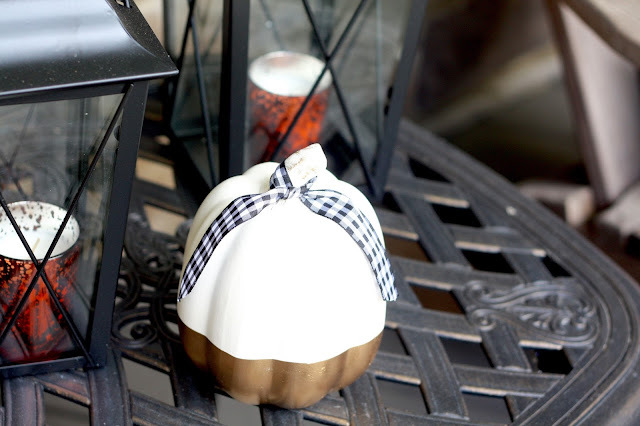 We'll visit a pumpkin patch sometime this month and have real pumpkins for our front porch. 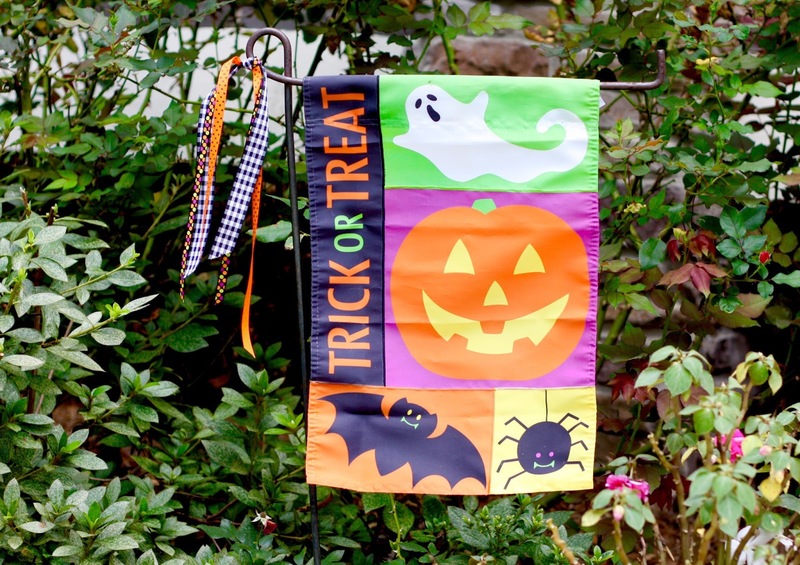 However, because we live in the south and because it's still pretty warm I like to wait until closer to Halloween so they don't end up rotting before the end of the month. Until then we'll just enjoy these goodies! Each year I like to get a few new things to add to my decorating stash and this year I found myself checking out Oriental Trading for all they had to offer. They have so many Halloween decor options. 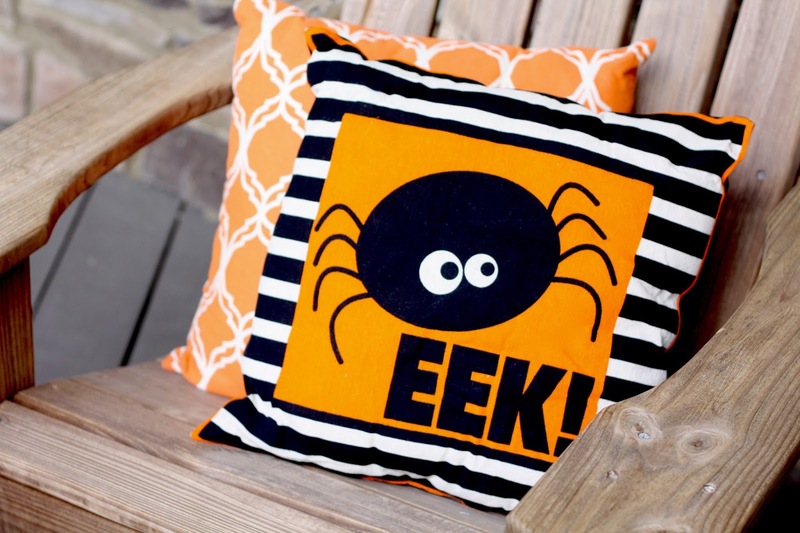 Everything from traditional scary decor to outdoor blow ups and party decorations, but there were a ton of really cute things that fit with my decorating style also! 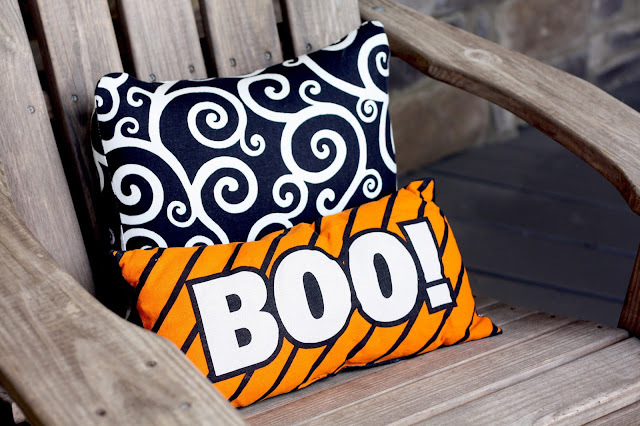 These adorable Halloween pillows came in a two pack. I had originally planned to use them in our basement, but when they arrived I knew they would look great with the accent pillows I already had so they found their new home on the porch. A few other new items are these lanterns which also came as a pack of two and I am so obsessed with them. 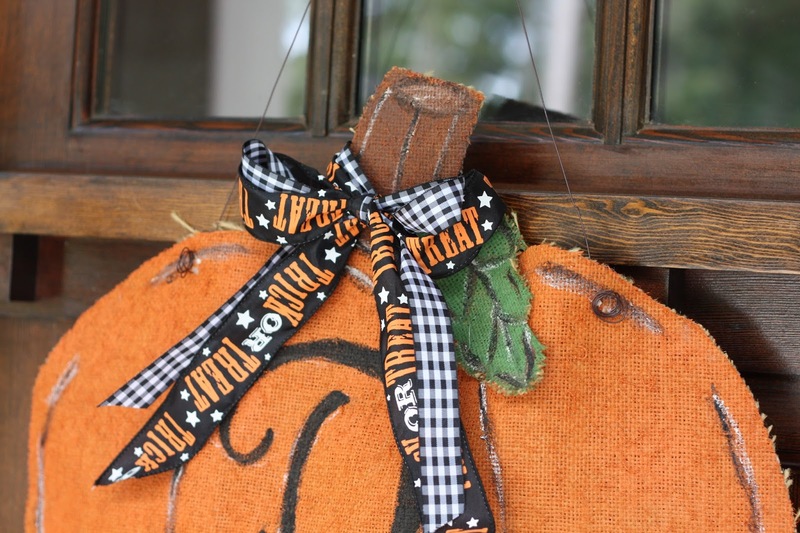 They work great on my porch for Halloween, but I have plans for them indoors after this holiday. I love that I can easily change out the candles with different colors to change it up from space to space and the varying heights are a no-brainer when pairing things together. Plus, that little gold dipped pumpkin made me all kinds of happy. 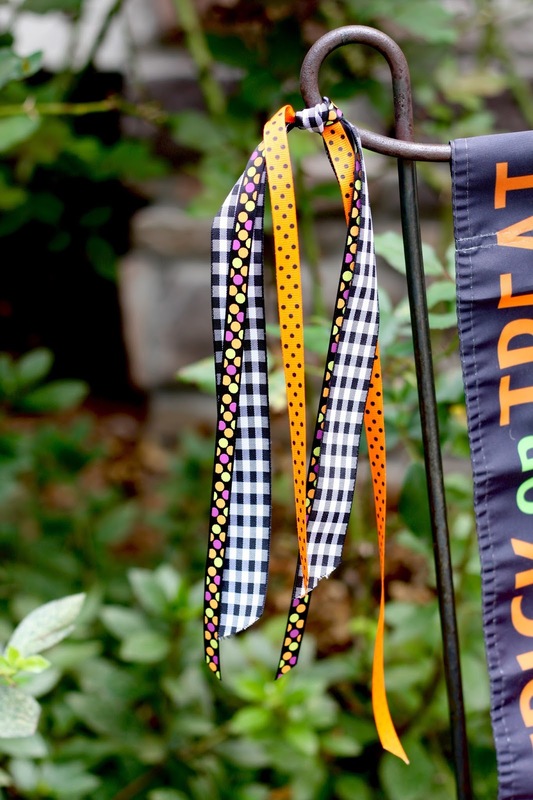 One thing I always like to do is use decorative ribbon in varying places to sort of tie things together. 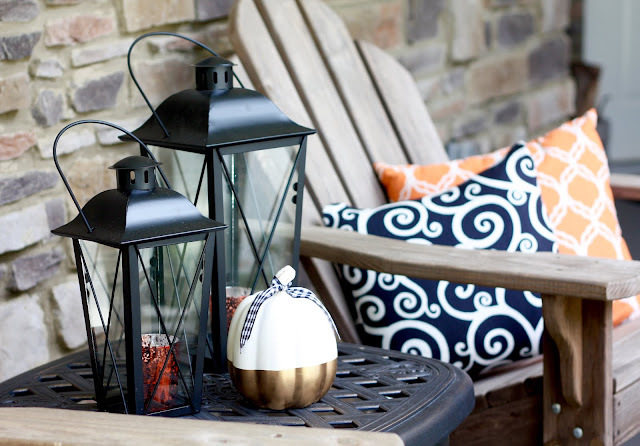 It adds a little extra touch to certain items and helps everything to coordinate throughout a space...in this case, my porch! I still need to switch out my flower pots on the front porch for some fall blooms, but after that I'll be done. 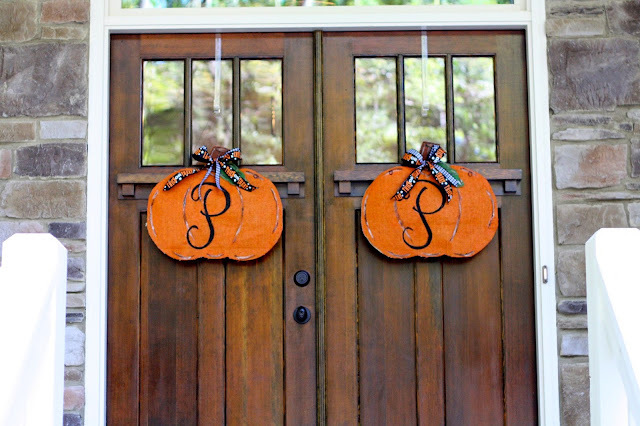 I can't wait to welcome trick-or-treaters on Halloween! Thank you to Oriental Trading for providing me with the new decor items. All opinions are my own.